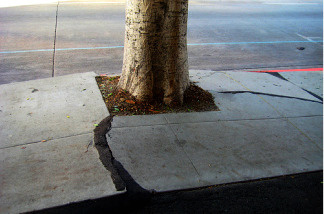 Are you an L.A. resident with a broken or buckled sidewalk? To receive federal grant money, the city of Los Angeles in 1974 agreed to take on full responsibility for sidewalk repairs, but, within a few years, the backlog of broken sidewalks had become huge. In recent years, suggestions to add a sales tax, a fee or a new policy to split repair costs with property owners have been floated, but failed. Are you an L.A. resident with a broken or buckled sidewalk? What are your ideas for paying for sidewalk repairs? Answer our short set of questions and help KPCC's reporting. Everything you share will be read by journalists only, and your responses are confidential unless you tell us we may publish them.